Although the Internet is regarded as one of the most fundamental aspects of life these days for business, pleasure, education and entertainment it has also introduced a whole new wave of criminal activity. Where children are concerned, there are real dangers of uninvited guests talking directly to our children in our own living rooms through the Internet and chat rooms. We never know when a child of ours is talking to someone they should not be on chat rooms and social networking sites. The worst aspect is the anonymous identity and incognito behaviour of the person at the other end, as the Internet provides an easy method of pretending to be someone else. Both children and adults cannot tell at any moment who is typing messages at the other end of a chat conversation, unless they have a web camera hooked up. However, even a web camera does not prevent us from being diverted from the real intentions of the person at the other end, unless of course we know the person our child is chatting to. ”Grooming” is becoming a well known term for Internet criminals. It is when your child becomes involved in frequent conversations in chat rooms and social networking sites with a complete stranger, and this stranger more often than not pretends to be someone else. For instance your little girl may think that the person is another little girl and there is nothing amiss in the conversations. This is a danger especially when she cannot see who she is talking to. Criminals like these are very convincing and good at shielding their true identity. This is the process of “grooming”. The motivation is usually of a sexual nature and many paedophiles will try to meet up with your child with the sole purpose of abusing them sexually. They are usually middle aged men however middle age women, young women and young men have also been convicted of the offence of using the Internet for their criminal activities. This description may be very graphic but it is a fact and parents need to be vigilant at all times with regard to their child’s use of the Internet. You can no longer just rely on keeping a close eye on them when they are out playing but in the walls of your home when they are on the web, especially in chat rooms and social networking sites. By the way, young boys are as much at risk as are girls when it comes to these types of offences. 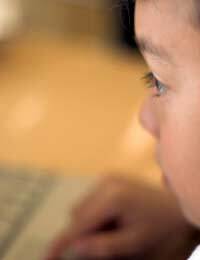 Paedophilia is not new but the Internet offers a new way to get to your children.It is a problem to constantly to progress your child in Internet chat rooms and social networking sites. It also takes away their enjoyment from talking to their genuine friends and relatives. It is also very time-consuming as a busy parent when you have lots of other things to do. Provide Some Rules For Your Child. However, by following some commonsense guidelines we can make our children safer. Use a nickname online, never your real name. Never reveal where you live. Do not to tell anyone which school you go to. Never give out personal phone numbers. Never agree to meet anyone without your parent's consent and go with your parent. Tell an adult if anything strange is happening online or they are saying things which make you feel uncomfortable. Introduce yourself to your genuine online friends, especially if you want to meet them. These are just a few ideas you could try. Perhaps you could even print this list off and display it in a prominent place near the computer for your child's benefit.